If you’re on the hunt for a reliable, sturdy round base plate with hook then check out the Rope Services Direct website. Round plates with hooks are specially designed for use on yachts and boats. However they can also be used to hang up clothing and other items, although they have a huge range of uses across many industries. They’re ideal for use in a home, stables, cloakroom or workplace to keep your coats, bags and other items together. Created using strong marine grade stainless steel, our highly reliable round plates with hooks are great value and easy to screw into many different surfaces. 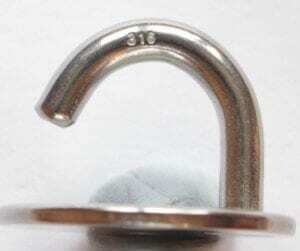 If you’re using your hook on a boat deck, don’t forget to check the maximum load your hook can bear in relation to its size (we can help you with this). They’re completely rust-proof too, even when used outside. Plus, they’re also handy in other leisure activities like sailing, climbing and horse riding. Wondering if it’s definitely a round plate with hook you actually need? Often it’s tricky to decide, so why not browse through our snap hooks, eye bolts and lifting shackles as well, or contact our friendly team for advice. 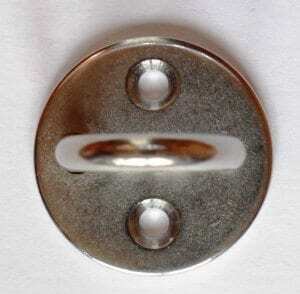 From our sizable warehouse in the West Midlands, we’re able to offer an amazing variety of round plates with hooks to suit any requirement or project and can save you money, time and hassle. To place an order, you’ll simply need to fill out a quick online form here. Need to ask us a question? Contact one of our helpful team on 01384 78004 today. Round Base Plate With Hook Overall rating: 5 out of 5 based on 6 reviews.